Our 2018 Impact Report is here! For the last 22 years we’ve worked with companies from throughout the nine Bay Area counties, providing hands-on advising, acceleration, and investment. In the past year, our pro bono advisors donated over 1,200 hours, our companies raised over $6.5mm in just one year, and the total number of people employed by our companies grew by 16%, year over year. We are very proud of our impact, of our metrics, and of the growth of our companies, yet we also know that much more work remains to be done. In this year’s report, we are happy to share our most up-to-date impact numbers, to tell the stories of our dynamic entrepreneurs, and to share a bold vision for a renewed, regional impact. 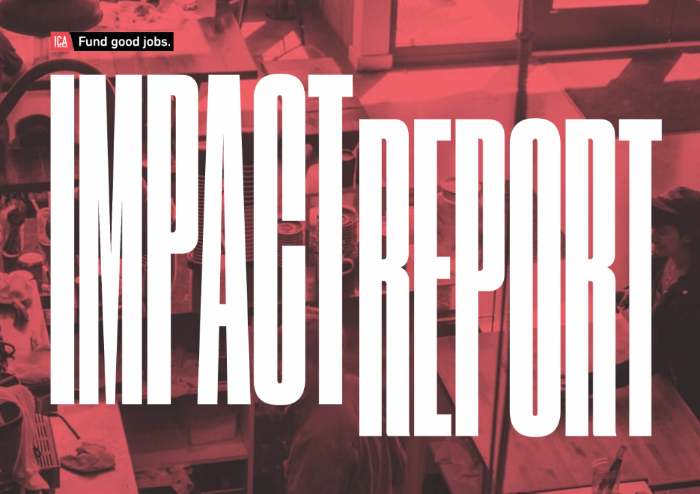 See all of our metrics, and read the entire report here: impact.icafundgoodjobs.org. Newer PostPhotos from Bridging the Bay, our reception SOCAP 18. Older PostSOCAP Week is here!